You’ll also meet one of the staff members from Prarie Woods Environmental Learning Center as he tells us about the voyageur canoe trip that he is leading. Prairie Woods is a nonprofit learning center that is committed to providing outstanding environmental education and outdoor experiences for people of all ages. This is a great program and an even better story. 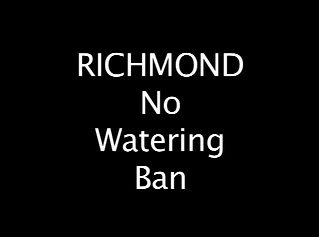 Way to go Richmond Resort! This story is sponsored by Richmond Body Shop. Welcoming all insurance claims and private party repairs, we are equipped to offer repairs for almost any vehicle. We specialize in frame & unibody repairs, collision repairs, glass repair and replacement including windshields, and offer wheel alignment services.We provide color matching with the help of our Dupont computerized paint mixing system. We offer free onsite computerized estimates, except for hail damage (call or email for details). As part of a community effort, the ROCORI Middle School has teamed up with Assumption Community to help the Stearns County Watershed District plant along Cold Spring Creek. In this story, you'll hear from 7th grade science teacher, Pete Spengler as he tells us about the gardening efforts his students are involved in. Spengler feels that often teenagers are viewed as more of a nuisance than a help to the community. This is a way for kids to give back and show that they truly care about the Land of ROCORI. In this story, you will also hear from Tony Nathe, an independent consultant at Assumption Community. Nathe is involved with the Walk n’ Wheel Loop project at Assumption as well as many other collaborative community programs. This week, DigElog ROCORI proudly recognizes Assumption Community as our ROCORI Business of the Week. The fall is now upon us, but there’s one last thing to be done before you can secure the garage for the winter, and that one important thing is to clean up! The Cold Spring Chamber of Commerce is hosting their annual COMMUNITY CLEANUP at ROCORI High School on Saturday September 13, 2008 from 8:00 a.m. until 11:30 a.m. In this story you’ll hear from Cold Spring Chamber event coordinator John Frischmann and Troy Freihammer from Stearns County Waste Department. 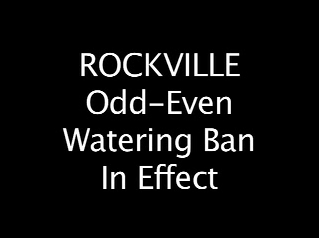 Each of them urge ROCORI residents to get on out this Saturday and get rid of some of the junk that might be piling up in your garages, tool sheds, basements and backyards. There is a small cost for disposing of your waste (which covers cost of disposal), but the main focus is to make sure residents can properly throw away their garbage and hazardous materials. On Thursday, March 13th, the Cold Spring Area Chamber sponsored a noon luncheon where the topic of discussion was Cold Spring Granite's Downtown project. 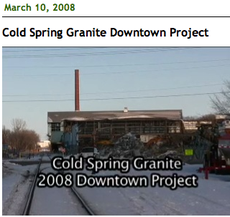 This story includes a presentation made by Cold Spring Granite project leader Gary Theisen. 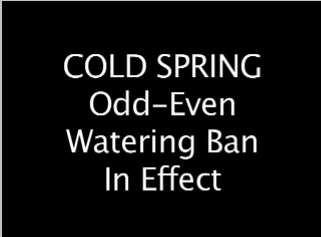 The video story above includes an interview with Cold Spring City Administrator Larry Lahr. 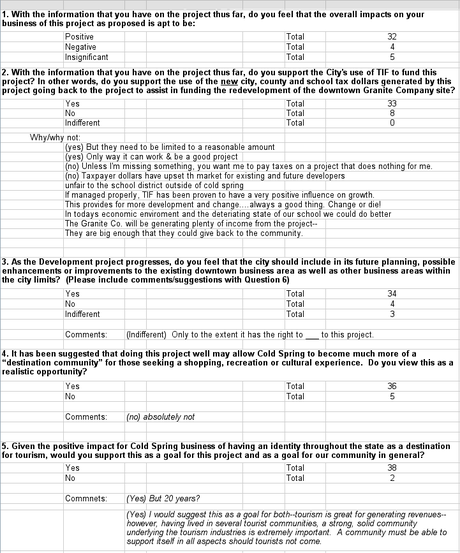 Larry digs into the Cold Spring Granite Downtown Project where the city is being asked to consider millions of dollars of Tax Increment Financing. Larry's video explanation of the proposal is intermingled with scenes from the old plant site where a massive demolition project is underway. This includes views from all sides of the project. This story is part of our ongoing coverage of the Little Rock Lake Conservation Project. As part of this project, various workers and community volunteers perform tests that help professionals understand problems with the watershed. In this story, we had a chance to interview the project manager Annie Felix. Annie told us about some of the tests that were performed on Little Rock Lake and why they are important. We had a chance to catch up with Water Plan Technician Annie Felix. She is in charge of collecting water samples from the creek as a part of the Little Rock Creek project. Recently we had an opportunity to go along with Annie as she explained the process of collecting water samples and how they are beneficial to the project. On Saturday September 8, members of the Cold Spring community gathered at the ROCORI high school as part of the Community Cleanup event hosted by the Cold Spring Chamber of Commerce. This story features footage from the cleanup as well as an interview with a Chamber member that helps put the Cleanup event together every year. The Richmond Canoe Park is one of the new summer adventure spots in Richmond. 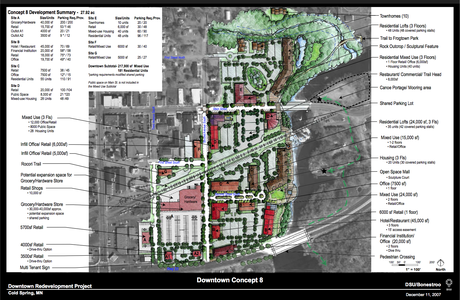 The Canoe Park is located on the west end of town and, in the future, will include an extensive walking path. Right now, the park consists of a few barbecue grills, a fire pit, and a number of picnic tables. The park is located right on the river and has various locations of overlooks and park benches.